The sightseeing center of Kyoto, preserving a variety of architecture and gardens, as well as many cultural masterpieces. The eastern part of Kyoto's city center is called Higashiyama, located at the west end of the Higashiyama Mountain Range. As early as the middle of the 14th century, many shrines, temples and aristocrats' villas were built in this area, where a variety of architecture and gardens, artistic and cultural masterpieces such as paintings and crafts were created. Many artistic activities such as 'ikebana' (flower arrangement), the tea ceremony and Noh performances flourished and developed in this area as well. 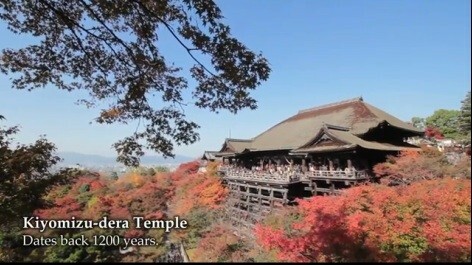 There are many masterpieces of historic architecture still in existence today, which attract many visitors and tourists from every corner of the world.In the southern part of the Higashiyama district is the famous Kiyomizu-dera Temple, built halfway up a steep cliff with its main hall projecting over a steep precipice. Yasaka-jinja Shrine, built around the 7th century, is also well known as the central site for the Gion-matsuri Festival that is held in summer.